We spent a couple of hot and fun days swimming in Palm Springs. It was just Moms and kids and we had a great time. We swam, ate, and rested. What could be better? We had a wonderful trip to Tahoe. We saw lots of family and lots of beautiful scenery. Grandma and the boys cooled off back at the trail head at the end of the hike. Davin braved getting under the little waterfall. Emily fell asleep on the way back down from the hike. Poor Dad had to carry her all the way. We made it to the Pyramid Lake waterfall. It was amazing. Emily made good friends with her cousin Isabella. They played dress up and princess all weekend. Davin and Carter spent lots of time in the creek and went through lots of clothes "accidentally" getting wet. We spent Friday in San Diego with the Marshall clan. We had had a great afternoon at the beach and then went to watch fireworks nearby. Here are the events from the last couple of weeks. Carter received a perfect attendance trophy and a medal for math facts. Davin received trophies for perfect attendance and 100% on math facts. Emily turned 3. We can't believe it. She is growing so fast. Happy Birthday Emily! We had a great afternoon at the First Grade teddy bear picnic the last day of school. We had a yummy lunch and a last chance to play with Davin's teacher and classmates. Carter and buddies completed their Cub Scout program and received their Arrow of Light Award. They are now officially Boy Scouts. Awesome job boys. Davin lost his big front tooth. He was so happy. He got $2 from the tooth fairy. We had a beautiful summer day at Lake Gregory. The weather was perfect. All three kids love being in the water. Carter is such a good swimmer. He swam all the way across the lake and back again. Davin and Emily had fun on the paddle board in the shallows. Carter got to ride out into the water fountain with his friend Ethan on the aquabike. The kids made their own "jacuzzi" in the sand. We had so much fun! I told Carter to say cheese- so he pointed to the cheese. Hee hee. Well let me start by saying we have been really busy. I haven't posted since April. Pretty sad. Anyway, here are the latest pictures and news to catch you up. Carter is still involved in the Mountain Strings Program. They had a great concert this week. We attended as a family and friends Torie and Tara were able to come also. Carter also had a big State Float parade this week. All the fifth graders created a rolling float and traveled around the playground with them. Carter had Michigan and did a great job both on his written report and his float. They had an all American picnic lunch after the parade. 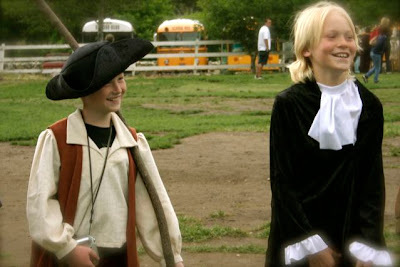 Last week the fifth graders went to Riley Farms with a Revolutionary war theme and had a full day field trip. Grandma Judy made Carter the perfect costume. 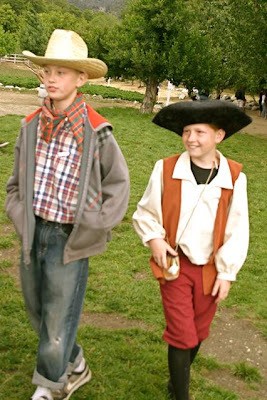 Here he is with his friend Ethan. Emily's favorite past time is changing her clothes. She changes into different clothes or dress up outfits at least 5 times a day. I just laugh and appreciate that it has encouraged her to get herself dressed without any help. We call this one "Shakey-Shakey". The boots really top this outfit off! When she wears this she is Dora. Dora dress-Dora glasses-Dora hat. This outfit was number 6 for the day I took it. Davin was in Track again this year. He really enjoys it. He loves the high jump. His best events are the long jump and the discus toss. His top discus throw was 31 feet! We participated in a stake wide service day. There were different service projects all over the San Bernardino valley that day. We painted this whole wall. It was fun to work together. Well hopefully it is here soon. We are still waiting for the warm weather. We woke up to snow two days ago and just want to be able to play outside! Here is Emily's newest dress up fun. She got it from Grandma and has been wearing it each night over her jammies. We had a great visit to Utah. We enjoyed seeing everyone. Here are the pictures from Antelope Island and our BBQ dinner. We made it to the top of the very big hill. Woo hoo! Here is the newest addition to out family. Such a cute little guy. It was so nice to get to play with him.